Good news for electric road trippers and people still suffering from range anxiety: Tesla announced today that it plans to double the size of its Supercharger network, with some sites being constructed along busy routes to accommodate several dozen Teslas charging simultaneously. The company announced the expansion plan on Monday in a blog post, which said it’s “making charging an even greater priority” as it prepares to launch production of the Model 3 sedan, Tesla’s first mass-market vehicle. In the five years since the Supercharger network was unveiled, Tesla said it has built more than 5,400 stations, along with 9,000 Destination Charging connectors at hotels, resorts and restaurants. “But we know that to truly advance electric vehicle adoption, we must continue investing in charging infrastructure,” the company said. 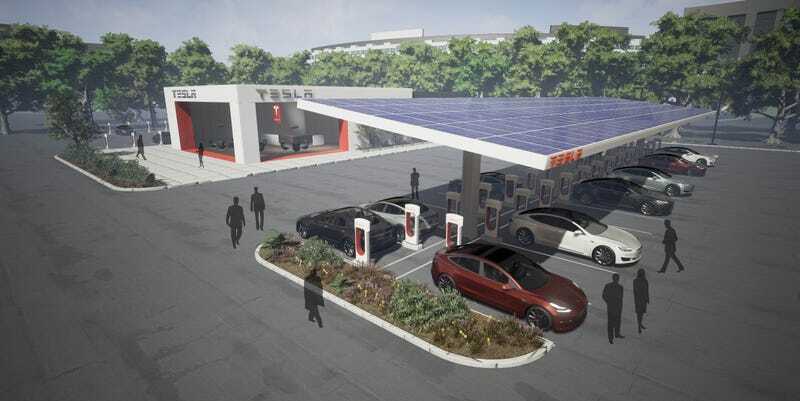 By the end of this year, Tesla said, there’ll be more than 10,000 Superchargers and 15,000 Destination Charging connectors. Earlier this year, Tesla announced a new plan to charge owners a usage fee, with specific costs per minute depending on region. The ramp up coincides with the planned July production date of the Model 3. Tesla founder Elon Musk said he wants the automaker to produce 500,000 vehicles in 2018. “We’re moving full speed on site selection and many sites will soon enter construction to open in advance of the summer travel season,” Tesla said.